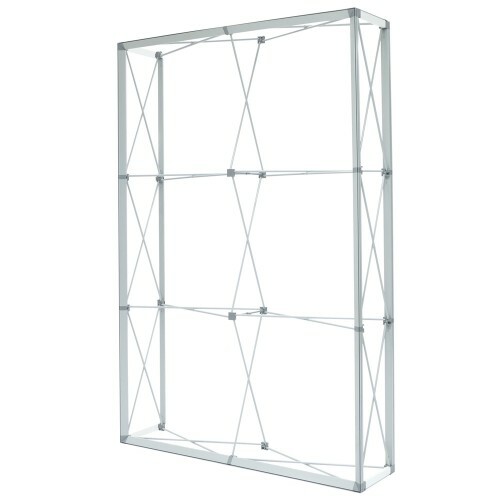 The Lumiere popup frame is made from an ultra-lightweight aluminum and designed to hold SEG fabric graphics. The vibrant stretch fabric graphic is an ideal eye catcher for your tradeshow, exhibition, or conference. Backside remains open for included shelf and storage. Includes carry bag. Popup displays are one of the fastest displays to setup and take down. Lumiere Popup Booth Backdrop Display 5 ft x 7.5 ft, Includes Single Sided Fabric Graphics The L..
5 ft x 7.5 ft Custom Printed SEG Graphic For Lumiere DisplayThe Lumiere trade show backwall po..
Lumiere Portable Popup Display 5 ft x 7.5 ft Double Sided Push Fit Fabric Graphic The Lumiere f..
Backlit Banner for Lumiere 5 ft x 7.5 ft, Graphic OnlyThe Lumiere backlit graphic is made from high ..